The other day I was typing up a post about cleaning when I noticed that the very laptop I was using (and have been using almost daily for the past 6 years!) was disgusting. It always amazes me how easily I can subconsciously ignore the imperfections of objects that I see and use every day. My laptop was well past due for a good clean. The only problem was that I didn’t have a proper laptop screen cleaner on hand. A quick google search later and I discovered a super cheap, easy, and effective DIY cleaner that I could concoct out of ingredients I already had at home. 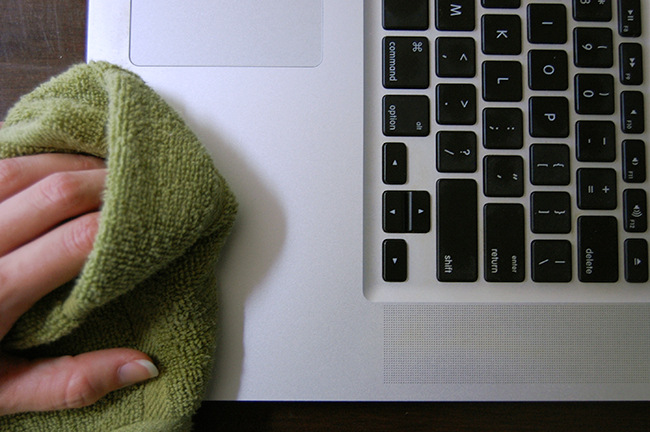 If your laptop also needs some love, here’s how to clean a laptop screen and keyboard. There is so much satisfaction to be gained when seeing all of the crumbs and gunk fly out from under those keys! Don’t forget to dust in the USB and HDMI ports as well. Now for the computer screen cleaner. From my research I learned that using distilled water is key here because the minerals in regular tap water can leave streaks on your screen, however if you’re in a pinch and need to use tap water I’m sure your laptop will survive. Never spray any liquid directly on your computer – always spray on a rag (or preferably a microfiber cloth if you have one), then use the damp cloth to gently wipe any fingerprints or smudges from your screen. When I’m typing my hands rest on either side of the track pad and the oils from my skin build up on that area contributing to the grunge factor of the whole thing. So gross. Wipe it all away! And done! Some websites suggest that you also lift off each key of your keyboard to properly clean underneath but I wouldn’t recommend that. I have PTSD from when I was in high school and my baby brother would sneak into my bedroom and rip all of the keys off of my old PC laptop for fun (sigh, toddlers…). Those keys were almost impossible to put back on properly! Proceed with caution.